Chicago's recent junk-bond downgrade by Moody's begs the question, what happens next for the city? While Mayor Rahm Emanuel did not provide any hints at his inauguration speech on Monday, Moody's offered a few suggestions in a Q-and-A-style report explaining the meaning of the downgrade and its implications for Chicago. In the case that Chicago cannot pay off its debt on time, Moody's says the city has three options: "massive revenue raising and expense cutting," bankruptcy or bondholder impairment. At the moment, bankruptcy isn't a viable option because it is illegal for local government in Illinois to file for it. This means that a hike in taxes could be on the horizon to help fill the gap in unfunded pensions. 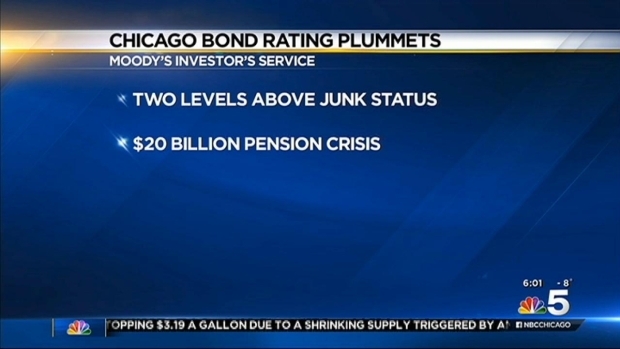 Moody's downgraded Chicago's credit rating, making it the second worst in the country after Detroit. As for whether Chicago is on its way to becoming the next Detroit, the credit rating agency Moody's says not so fast. In its report, the credit rating agency addressed the rising concerns about Chicago defaulting on its debt and declaring bankruptcy. Fortunately, Moody's believes that isn't likely, saying the possibility of default is "a relatively small risk." The downgrade comes after the Illinois Supreme Court struck down a law supported by Gov. Bruce Rauner that restructured pension obligations in order to reduce debt. Although Moody's has assuaged fears about default and bankruptcy, the agency makes it clear that the pension crisis is serious business for Chicago. "We do believe ... that the city’s pension-related challenges are significant and introduce speculative elements into the credit profile," Moody's said. So what must the city do now to raise its credit rating to a more comfortable status? "We believe that Chicago’s administration will eventually have to increase pension contributions through some combination of operating revenue growth and operating expenditure reduction," Moody's says. "The magnitude of those expected budget adjustments will be significant and will force city officials to make difficult decisions for years to come." In other words, the road may not be easy, but it doesn't definitively lead to Detroit. Moody's notes that Chicago's ability to extract revenue from a large tax base is a plus for the city's credit rating, but ultimately its debt and unfunded pension liabilities overshadow the tax base. 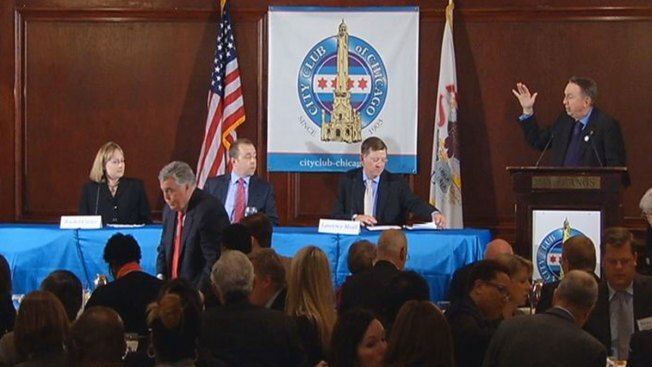 No matter which way Chicago goes in fixing its financial crisis, it's clear that tough decisions are ahead and taxpayer may suffer the brunt of it.